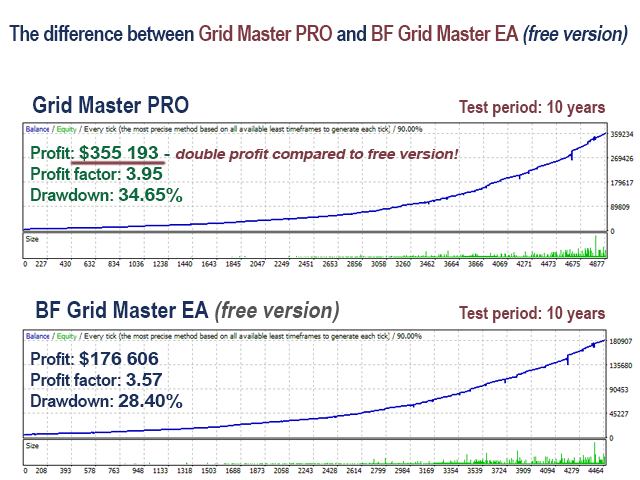 Grid Master PRO is the professional version of my very popular free EA - BF Grid Master EA. I have implemented a lot of new additional features and systems in this PRO version in order to improve its overall performance. 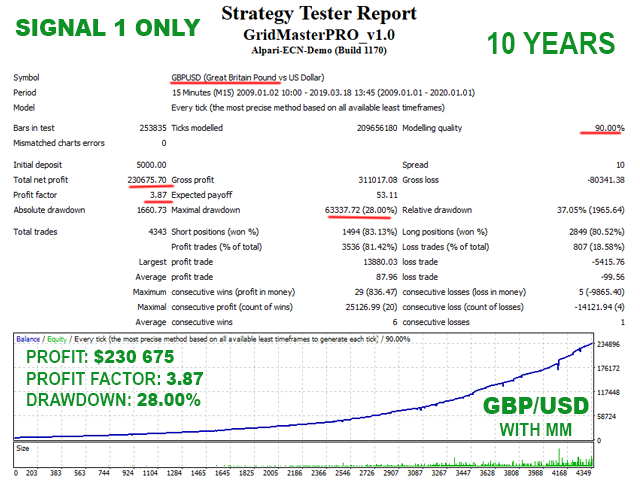 I have added 3 additional trading strategies in the Grid Master PRO which increase the total profit. I have added Advanced Time Management system, Notification System, Friday Exit System, Advanced News Filter and i have added additional parameters for making Grid Master PRO more flexible. WARNING: Grid Master PRO is a grid based trading strategy. You should not use it, if you are not aware of the risks associated with this type of trading. Do not risk money you cannot afford to lose! 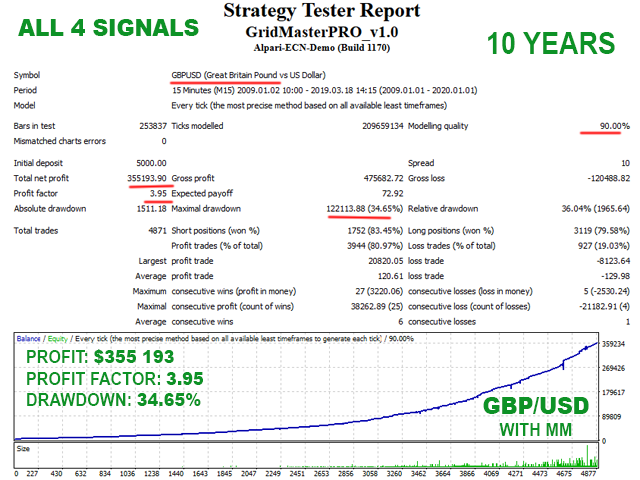 Grid Master PRO is an efficient trading strategy developed especially for GBPUSD. However, if it is used wisely it can be adapted and applied for almost any trading instrument. The grid based trading techniques are a very controversial topic in the trader’s community. The reason for this is the following - used properly with proper risk and settings, they can generate consistent gains relatively safe with performance incomparable with any other trading strategy. On the other hand in certain circumstances they fail dramatically. The key elements for the success of any grid based trading are the applied risk and the right entry and exit trading logic. 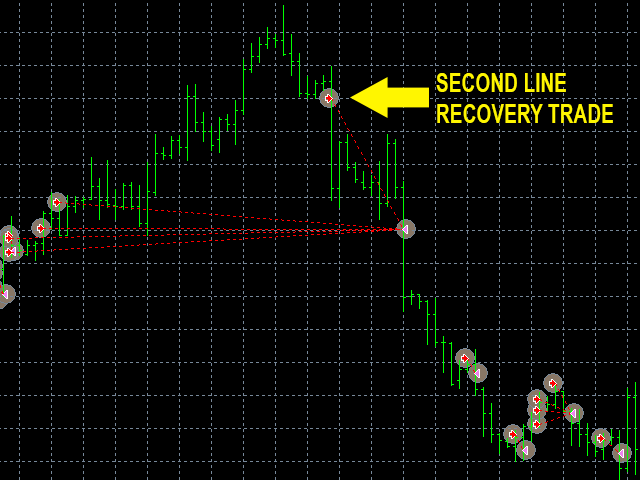 Grid Master PRO is designed to pick up the right moment for the initial market entry and for the following additional grid based recovery trades. The second safety line of additional trades is a unique feature, which is not present in any other grid EA on the market. This feature allows a safe “high frequency” scalping, when the price is in a narrow range and as well a second line of distant drawdown compensating trades in case the market price breaks in the wrong direction. The second line of drawdown compensating trades is initiated only in extremely stretched in the “wrong” direction market, only after a very strong market reversal pattern is detected. Please, backtest on GBPUSD after 2009, using the “M1 open price only” method, with start balance at least $3000! 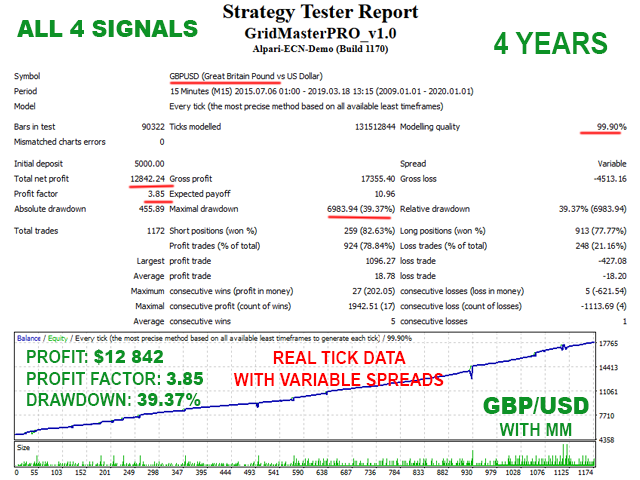 Using risk level equivalent on 0.01 lots on $3000 account balance, or lower, is essential for long-term success with Grid Master PRO!!! Magic - magic number - it is extremely important to keep this different for all robots. 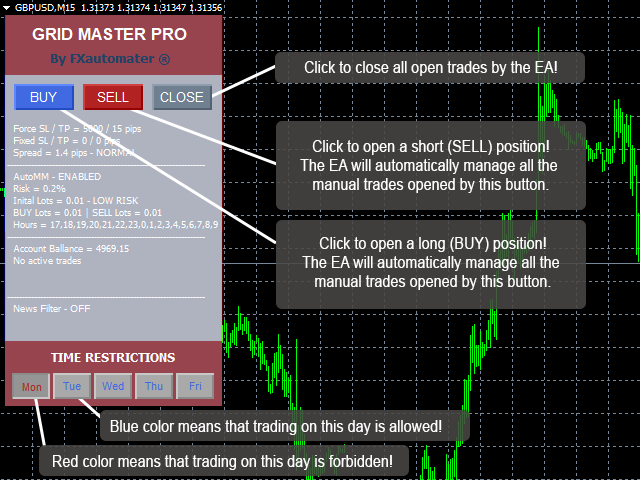 EA_Coment - text which will be added as a comment to each trade opened by Grid Master PRO. MaxSpread - maximal allowed spread for position opening. For more info, complete list of settings and video tutorials, visit the blog! A small bug related to Friday Exit system was fixed in this new version.